I just moved into the neighborhood and liked the idea of supporting the local businesses. After a hectic year of change, I decided I deserved a massage and the universe guided me to Knead A Back. Callie had an opening and I got an awesome massage, but way, way more than that. Callie ended my massage with some pro bono energy work. Her hands felt like they were on fire, she instructed me to do some deep breathing. She knew from our previous conversation that I was a nurse and I was struggling with an addiction to nicotine. She mentioned that our lungs are the place in our bodies where we often hold our unresolved grief. That knowledge resonated with me. I left that office and after 12 years of struggling with smoking, I woke up the next morning with no desire, whatever to smoke. I experienced no withdrawal over that week, or feelings of missing the disgusting habit. It was as easy as walking from one room into another, when normally I would be extremely irritable and ready to chew my arm off for a smoke. Inexplicable and odd, but it feels like a miracle to me..... and I’m going to receive this healing gift with utmost gratitude. The struggle is finally over. Thank you, Callie, from the depths of my very being. Callie gave me a wonderful massage! She seems to have an instinct and was able to hone in to what I needed. Highly recommend! Excellent massage therapist who cares about her clients. Highly recommend! This woman I think has powers! I came home feeling refreshed down to my core. I just had my first massage with Callie and it was incredible. As a person who struggles with relaxing and taking time for myself I left feeling like a different person. She is super thoughtful and truly cares about her clients. Highly recommend and looking forward to future sessions. Excellent. Tailors to your personal needs and makes you feel very comfortable. Won't go anywhere else. The space simply isn't large enough for me to accurately express my gratitude. After having an "intuitive massage" paired with Reiki healing I was relaxed, rejuvenated and even educated. The atmosphere is nothing short of bliss and everything from the temperature of the room to the sounds being played took part in this wonderful experience. I truly have found my healer, and have no desires to go anywhere else from this point forward. 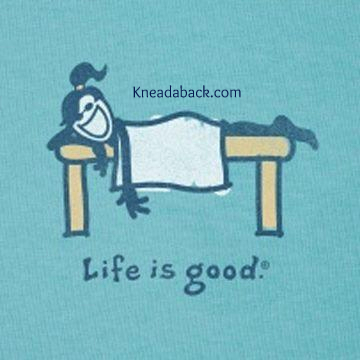 Knead a Back is incredibly relaxing, tranquil, and healing. During our session, Callie performed Reiki energy healing as well as massage. Stress had been manifesting itself in my body and mind in many ways, but after my visit with Callie, my energy & sense of well being immediately felt restored. She is very knowledgeable and helpful about literature if you may seek to learn more about energy, chakras, and healing. Callie is a very caring person and will help you release tension, whether it is physical, mental or both! An incredibly restorative experience. Today was my first visit to Callie and Knead a Back. As the busy Mom of 5 children who is also dealing with a cancer diagnosis and long term treatment, I was delighted to receive a gift certificate over the holidays for a massage. I was also able to receive a Reiki session as part of the massage and as a result I am more calm and centered (and pain free!) than I've been in a very long time! Thank you Callie!! Highly recommended! We have had Callie massage us for the past several years. My husband's job is hard on his back and he needs massages regularly to avoid serious head and neck pain. He has been getting massages from many different places over the years. We have found Callie to be the best. Not only is she a great massage therapist, she his a great person as well. She will be doing our massages for years to come. Highly recommend!! Callie is one of the best! I needed a massage and did not have an appointment scheduled, but when I called she was able to squeeze me in that afternoon. She is dedicated to her clients and wants to do nothing more than to help alleviate their tension and stress. I started going to Callie a few months ago. The first thing I noticed was that she was such loving and caring person. Even if you come for a massage she will talk you through whatever is on your mind and help you have peace about it. Callie will point you to authors, teachers, and healers that have helped her on her own journey. If you want a massage therapist/reiki healer that treats the whole body and soul then this is the person to go to. I can't say enough good things about her. As I do a great deal of research and writing, I get a lot of tightness in the neck, shoulders and back. Because a previous appointment I had was canceled, I hoped to find another practitioner that same day. Callie was very accommodating and courteous. She saw me that same day and was wonderful. I left feeling considerably better and "lighter." I was delighted by the difference I felt after just one visit! Callie gave me one of the best massages I've ever had. I had initially planned for ninety minutes but after the first fifteen minutes I realized that I wanted to stay longer and as such I went on for two hours and it was amazing. Awesome! Callie is the best. She takes time to truly understand your concerns and adjusts her treatments to meet your specific needs. She definitely cares about giving you the best treatment for your needs and not just a standard treatment. She's very attentive to your requests and will adjust her massage style to suit your needs at each appointment. She's been able to modify my massage from regular to prenatal. Her hours are very accommodating and scheduling has been convenient and easy. Callie has listened to me and been observant about changes in my body over time and has really gotten to know me. I've grown very grateful for the marvelous relaxation she provides for a reasonable price in a lovely setting. I went to Callie for a 1 hour Reiki and massage appointment. The room was pleasantly warm and the lighting was low and relaxing. She really listened to any areas that were bothering me, and immediately made me comfortable. After I got home, my boyfriend saw such a noticeable difference that he booked an appointment for the next day! I'm definitely going back to her in the future! The minute you walk in you can feel the peace of the place. The massage table is so comfortable. Callie is just wonderful. Not only does Callie have a relaxing space for her clients to visit, but she also does massages in your home. My husband and I have monthly massages to help with pain management. We've been seeing Callie for about two years and her treatment has made a dramatic improvement in our pain levels. Callie is very informative and provides an excellent treatment whether its for medical or just for relaxation. Callie, You worked out ALL that tension. Haven't felt this good in 2 years! I had the best sleep ever ! I am at work and I feel like walking on the clouds. Thank you !!!!!!!! !